Alvin Francis and Margaret Christensen Adams: Alvin Adams was referred to as living in #13 and this is the only one who might fit. He was born March 23, 1865, in American Fork, Utah Territory to Arza Matson and Marillah Olney Adams (q.v.). Margaret was born April 7, 1869, to Hans and Marion Jorgensen Christensen. They were married August 7, 1890, in American Fork and they had seven children: Vera Mary, Sadie M., Reed Alvin, Illa Christensen, Marvel Christensen, Wilford F., and Harold. They would have lived in #13 for a time between 1910 and 1929 but the census shows them in American Fork in 1910, 1920 and 1930. Margaret died November 5, 1924, in American Fork and Alvin married Lavina Hook Shields before 1930. Alvin died March 21, 1942, in American Fork and he and Margaret are buried in the American Fork City Cemetery. Arza Matson and Sabrina Clark Adams: Arza was born January 22, 1804, in Ontario, Canada to Josh and Elizabeth Chipman Adams. He married Sabrina Clark March 23, 1831, and they joined the Church of Jesus Christ of Latter-day Saints in 1836. He was ordained a Seventy on Jan 5, 1839, and on March 7 of that year he left Far West to go to Illinois. He was in Carthage at the martyrdom of the Prophet and carried the letter from John Taylor to Nauvoo announcing the event. He was sealed to his wife December 31, 1845, in the Nauvoo temple. 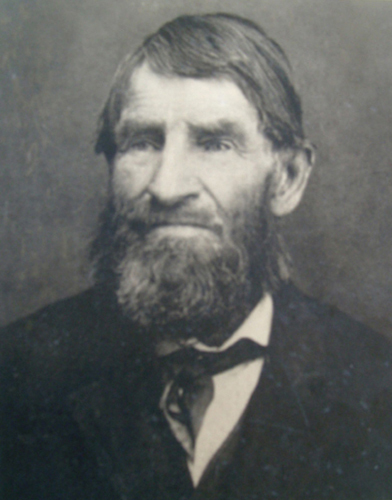 He migrated to Utah in 1848 and in 1850 was given permission by Brigham Young to settle American Fork, along with his brother Barnabas and five others. He married four other women: Editha Morgan Anderson on December 7, 1853; Marillah Olney and Catherine Cunningham on March 7, 1857, and Elizabeth Gaskill on August 11, 1857. Editha and Catherine were spiritual wives only. With the other three he had twenty-six children. On February 24, 1856, he was called on a mission to Fort Supply (Green River, Wyoming) at a General Conference in the Tabernacle in Salt Lake City. He apparently was very possessive of his property and in his journal tells of being mocked by his neighbors and was subject to their hatred and envy. He homesteaded 120 acres in the southeast area of Highland but, according to David Durfey, never lived there, although his was the earliest recorded Highland patent in 1875. His patent also included 40 acres in section 12 south of his Highland property, in American Fork. 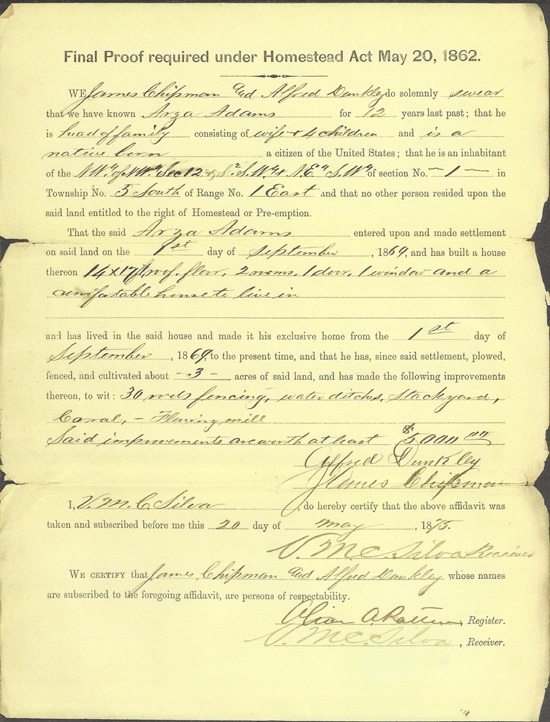 His patent affidavit shows that he built his home and moved into it on September 1, 1869, and was still living there on September 10, 1875, when his patent was issued. 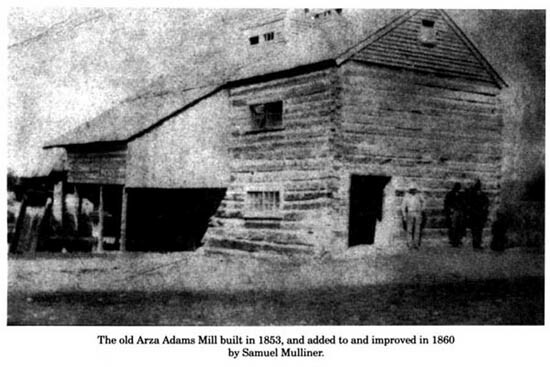 He also built a “flouring mill” on the property. 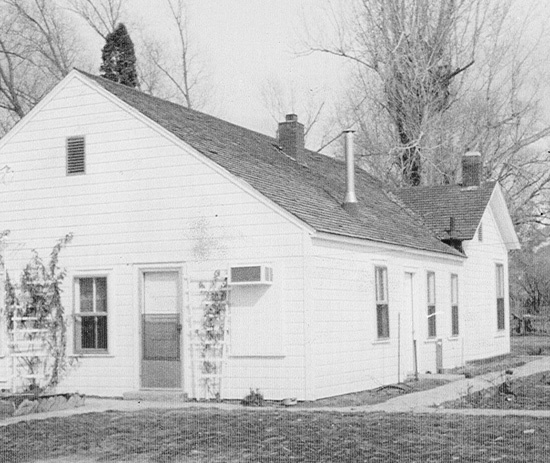 It’s probable that the home and mill were on the American Fork portion of his homestead next to American Fork Creek. The 1870 census shows him living in American Fork. Arza died April 15, 1889, in American Fork and was buried in the Pioneer cemetery, later transferred to the American Fork City Cemetery. Charles Fletcher Adams: Charles’ membership arrived in Highland in 1933 with no other family members accompanying him. He was born February 7, 1904, in Alpine to Albert John and Ada Jane Mellor Adams. He married Eva Clair McDaniel December 25, 1924, and they apparently divorced because he married Nellie Elizabeth Booth April 25, 1935, and Eva married Thomas Douglas Durand December 4, 1951. Charles died February 10, 1982, in American Fork. 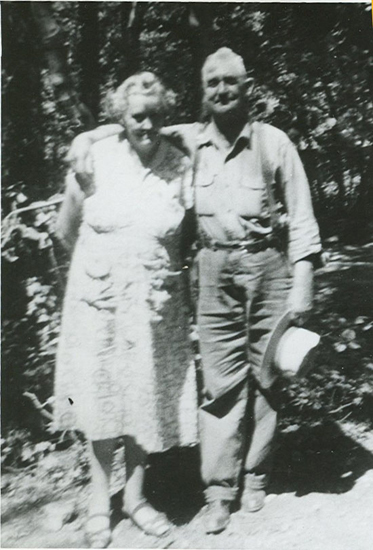 Silas Elmer and Martha Venetta Boulter Adams: Si was born June 8, 1889, in Provo, Utah Territory to John Alma and Mary Alice Frampton Adams. Venetta was born Jan 8, 1896, in Draper, Utah, four days after Utah was admitted to the Union, to John Amber and Martha Jane Mann Boulter. Her mother died when she was four and she was raised by a grandmother and five different step-mothers. Si and Venetta married October 8, 1917, in Provo and lived in an apartment in Salt Lake City for a short while then moved to Pleasant Grove. They moved to Highland (#99 on the 1958 Highland map - interactive, larger) in 1937 or 1938 after the birth of their 7th and 8th children-twin girls. 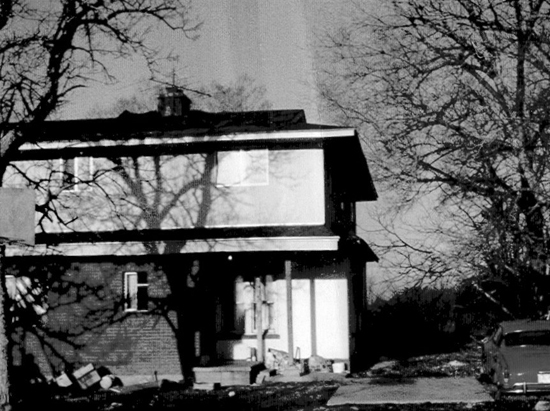 They lived in Highland for about ten years. Their son, Dean married Ila Strasburg, daughter of Evar and Esma (q.v.). Their family included eight children: Arvene, Bryce, Glade (who died at age 3), Don, Dean, Elvis and twins VaNetta and LaRetta. In August, 1956, sometime after moving from Highland, they were delivering the morning newspaper in Lehi and their truck was struck by a train. Si was killed and Venetta was seriously injured, taking many months to recover. Venetta died in 1986 at the age of ninety.